Dr. Krystal White has written an inspired relationship-hacking book to help us decipher WHY we love THE WAY we love. Her genius is understanding our bonding styles and what drives us to feel fulfilled. THE LETTER CODE is how we get our most important needs met. Do you lean in, lean away, stand on the same spot, or face to face? You could be a Letter A, a Letter W, a Letter Y, or a Letter H.
Last Thursday, I taught a webinar for the community of social media strategist and entrepreneur Laura Rubinstein, founder of Social Buzz Club. In anticipation of the presentation I poured through the web pages of Kindle to hunt for the most noteworthy features. My overarching take, as a result of this exercise, is that the entire Kindle platform has evolved nicely. Occasional annoyances crop up. But it’s a generous iteration. Here is an article I’ve written to explain. NOTE: The KDP environs are constantly shifting, so don’t get complacent. It’s not a secret that digital technology and the internet are the bomb! Totally disruptive. Totally innovative. Totally liberating. Totally exciting… to some of us. We, the unapologetic self-publishers of 2019, want to tear down the barriers to success with getting our books published and in the hands of eager readers. Lots of people are afraid of technology because they find it cold, counterintuitive, and awkward to use. But technology is always improving, so shunning it does us no good. When we can find an instance of a place where the user’s experience of online design—an abstraction called UX by graphic designers—is logical, straightforward, and flows seamlessly in a clear progression, we should celebrate that to the max. KDP has drastically improved UX. Whatever you think about Amazon “taking over the world” and Jeff Bezos’ rapid climb to the top of the social hierarchy in the United States, I think you’d have to admit that he understood the possibility of online technology to make our lives simpler and flowing before we did. That’s why he is such a powerful influencer — so wealthy. The admirably seamless UX is nowhere more evident in the Amazon stratosphere than in its publishing arm, Kindle Direct Publishing (KDP). When all the other stores were poo-pooing self-publishing, KDP started studying our writing and marketing habits and finding ways to serve us and invite us into partnership with them. The opportunity to partner with self-publishers on an open platform was an early opportunity missed by the arrogance of Barnes and Noble, which had the largest brick and mortar footprint across the nation. Now that everyone buys books online, B&N has been playing catch up in self-publishing systems. And as B&N catches up, KDP is forced to become even better so that we (self-publishers) remain loyal to it. DIY authors are a hot commodity because we drive a lot of internet traffic to online stores. Knowing that we have options is liberating! Let’s review the last decade of history. In this current “space race” of digital self-publishing, Amazon smartly bought a group of smaller companies and fit their offerings together to create a publishing jigsaw puzzle—the original print-on-demand paperback company, Book Source, was renamed CreateSpace. 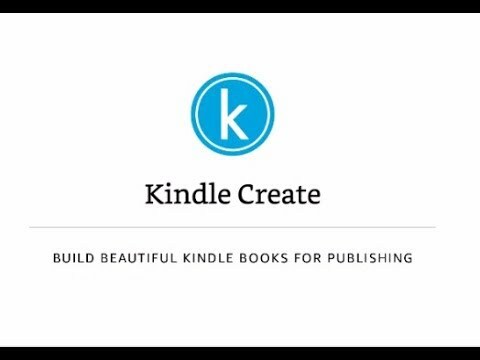 It remained known as such until Fall 2018, when this system was retired and everybody’s production files began to be rolled into Kindle Paperbacks — where royalty rates increased to a desirable 60 percent of retail price! NOTE: As of this writing, I believe all books on CreateSpace now have been transferred automatically to Kindle Paperbacks. None are left in the old platform–however, you can request your royalty statements. Amazon (Kindle’s umbrella corporation) also chose (a few years ago) to buy Goodreads (a social platform where authors can interface with readers), then Audible (an audio publishing company), and more. At each step ordinary self-publishers have been invited to participate and empowered to do it for little to no money upfront. A tipping point has been reached where the upgrades to the back-office publishing experience have made it possible to write and design books almost simultaneously, meaning that with a push of a button a respectable-looking book can be published in mere days. The improvements on KDP benefit consumers too—because frankly, as convenient as portable reading devices like the Kindle are, the appearance of self-published ebooks has always been pretty awful. To keep the content “reflowable” (meaning, it can morph in size and appearance) the formatting had to be very plain. It was hard to add more bells and whistles to a book design that had to be converted into a software that couldn’t accommodate them. Until. Recently. 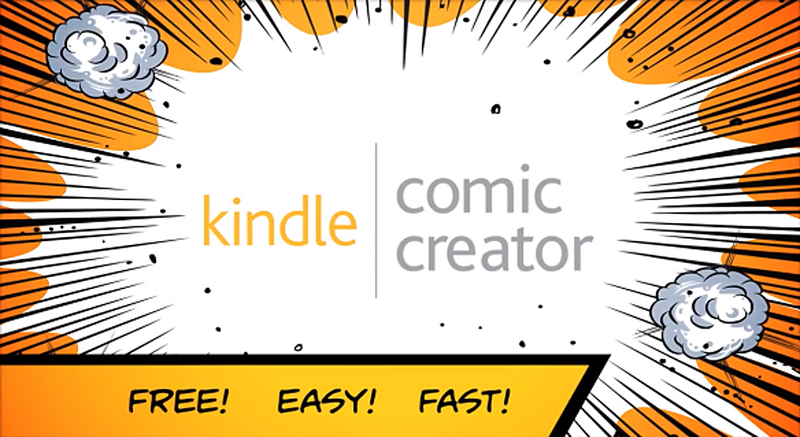 Now conversion of ebooks is better in Kindle, and there are KDP design studios that make it possible to do “non-flowable” (or static, if you prefer) versions of heavily illustrated ebooks, such as graphic novels, children’s picture books, comic books, photography books, and more. Progress leads to perfection, I suppose. My one gripe this week is how the proofs of the new Kindle Paperbacks come with ugly “Not-for-resale” ribbons running around them and a big clunky neutral bar code flopped down over the very content an author is attempting to proof. Yes, there are idiots out there who try to sell their own paperback proofs (duh) instead of ordering their real book. But all of us shouldn’t get punished. My praise for the week is how the customer service personnel seem to be more on their game. You can get to them through the dashboard in KDP or through the Author Central Author Pages. 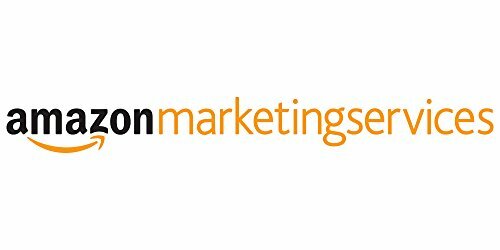 With the upgrades to its systems, DIY paperback publishers now have access to advertising tools on Amazon. Beta testing is being done (or has just been concluded, I’m not quite sure) on features for the ebook, like the X-Ray, where clickable links add value. The thing I like about KDP is that when the company wants us to adopt a new behavior they create an inducement to do so. And those inducements usually are tools that increase our sales. 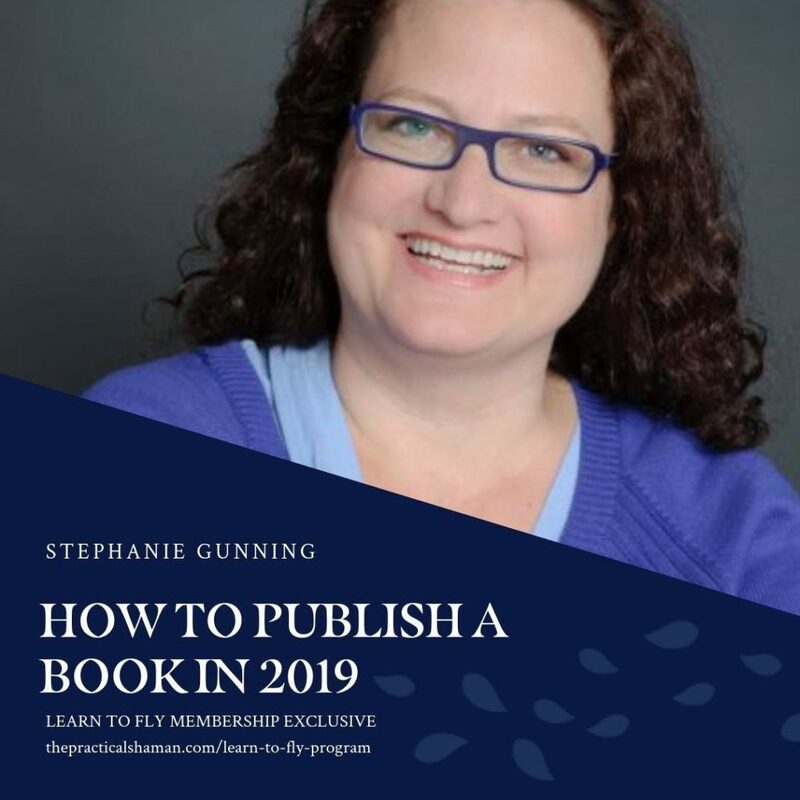 Savvy self-publishers need to know their own goals first so that they can discern which tools genuinely matter for them. Having tools available may empower some people more than others, depending on aptitudes for technology. This said, the good news is that help is definitely available, so authors can delegate tasks to support personnel that lie outside their own comfort zone. If they want to. Taking a good close look at KDP’s dashboard every month or two can be beneficial to those who recognize that the space is constantly evolving; the best publishing practice is to be mindful of your books and not neglect them by fitting a quick analysis to the beginning or end of your week or after big marketing pushes. Try thinking of online publishing as like a video game. The more you know about the possibilities, the more likely you are to ring bells and be a winner. Stay in touch with your books. Modify your description, pricing, and keywords periodically (how about monthly?!). And try out the new tools to assess them. Remember, KDP exists because it has always seemed like you and me and others like us wanted it. If you’re new, don’t be shy. Come play with the rest of the kids in the DIY playground. Noreen Sumpter is a phenom. A life and business coach. From England. I met her in her role as VP of New Member Engagement for National Association of Women Business Owners (NAWBO-NYC), a truly fine organization of which I am a proud member. 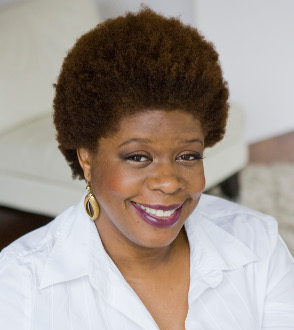 This week I’ll be the featured guest on Noreen’s biweekly radio program, “Beyond Potential,” which airs from 9pm – 10 pm Eastern online at https://talkradionyc.com. Part of the hour we’ll be taking calls from the public via the hotline 877-480-4120. TOPIC: Writer Your Book, Change Our World ! 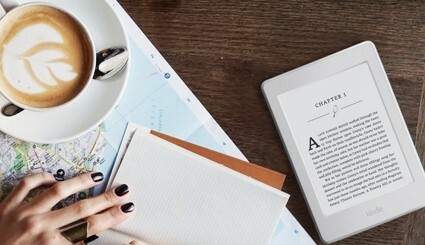 Is it time for you to take a second look at do-it-yourself publishing? 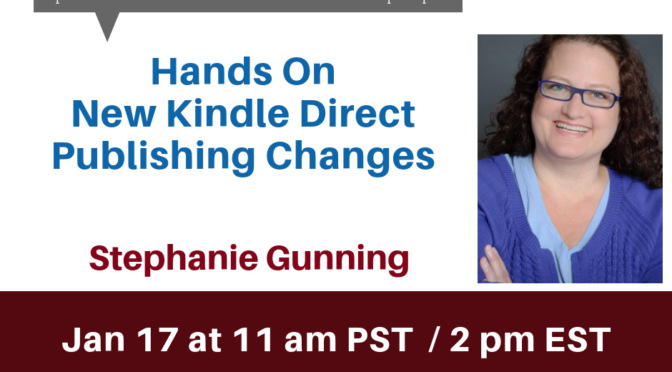 In recent months, Kindle Direct Publishing (aka KDP) has rolled out a series of user-friendly online tools that put more control in the hands of authors. These include technology for desktop design and marketing, publishing paperback books, and an improved user experience in the system. 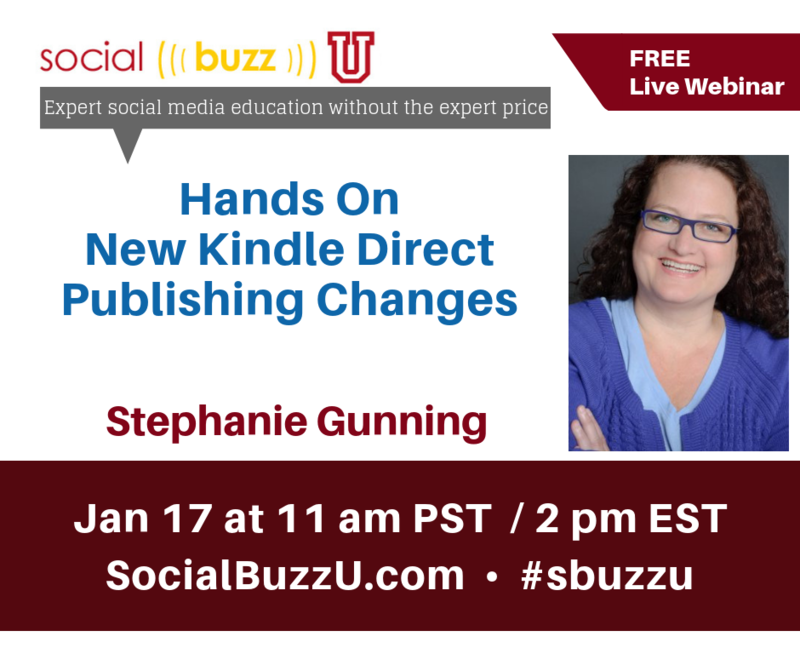 This webinar is for seasoned and novice self-publishers. December is a month in which annual business plans are put into place by those of us who work from home offices and kitchens–or corner offices and shops. Dreaming and hustling are the two legs of entrepreneurship. Our end-of-year planning sessions may include reviewing the detailed metrics of the previous year and auditing our website functionality and content, or boldly outlining broad strokes of our wildly important goals. Year 2019 seems as fresh as a new copper penny, gleaming with promise. Who do you want to be? These ten books may help you decide. There’s a lot to be said for confidence. Have you ever been in a room when a confident women walks in? She owns the space. She knows what she wants and she’s not afraid to go after it. In today’s world, where women are more educated and more well qualified than ever before there’s no reason they should still be making 20 percent less than men. 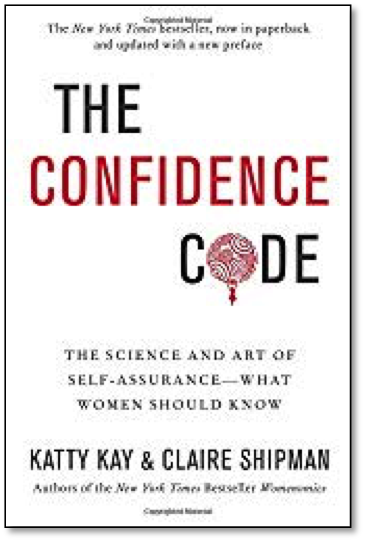 In The Confidence Code, Claire Shipman and Katty Kay argue that the key reason for this outrageous discrepancy is confidence. If you’re looking for the It factor and want to be the woman to watch, give it a read. Where will your confidence take you? Raise your hand if you’ve ever walked into a meeting with your boss looking for a raise only to walk out wondering, What just happened? Raise your hand if you thought you were going to land a client only to walk out of your face-to-face “closing the sale meeting” feeling like a sad little puppy with its tail between its legs and no deal. Raise your hand if you’ve ever had to speak in front of an audience only to start sweating and shaking through the whole presentation you’ve prepared and feel like a phony by the end of it all. There’s a reason you come out of these experiences feeling like a fake and a failure. It’s because you lack presence. When you have presence, you don’t care about what other think of you. Your main focus is what you think of yourself. Often times the work that needs to be done is internal and Harvard professor Amy Cuddy is here to take you on a spiritual journey to find the presence needed in order to approach your next challenge with your head held high. Full disclosure, I am Rania Anderson’s editor. And a proud one. I can’t even begin to tell you how long I waited for a book like this to be written. We live in a day and age where stories of men acting inappropriately toward their female colleagues are on the rise. We hear about the backlash and consequences faced by those accused of this behavior, but we often don’t hear about the men who stand by the women being treated disrespectfully. Those “Good Guys,” as Rania Anderson calls them, understand that we succeed together. This book focuses on the positive. It addresses what is working and how we can make things better. It’s an opportunity for men to be part of the change in the institutions and mindsets of the business world. Girl bosses and team leaders need to read it as much as men. But it is definitely a book to share with your colleagues. Do you make a six-figure salary? Do you want to make a six-figure salary? I can almost guarantee you answered yes to one of these two questions. 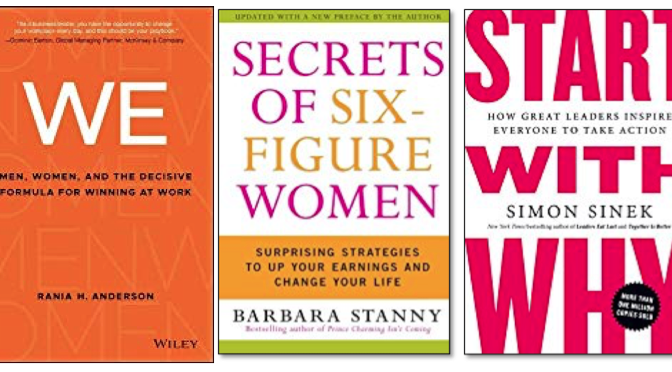 Women are quickly outgrowing men in the six-figure category and Barbara Stanny wanted to know why. 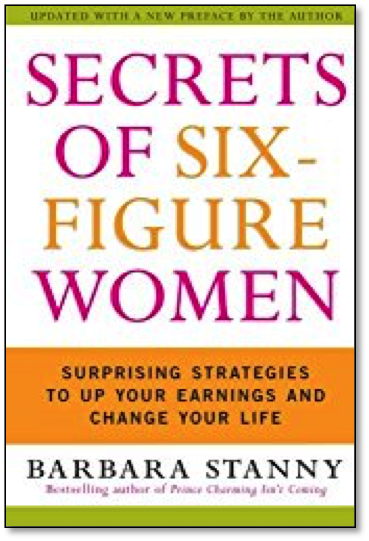 In her book, Secrets of Six Figure Women she looks into the characteristics of successful women and sees that they have a lot in common. So if you’re making the big bucks or aspire to, this one is for you. You’ll find you’re in good company! Women start and grow businesses for different reasons, and money is one of the compelling ones. Money brings us options. Simon Sinek has the third most popular TED Talk with over 28 million views and there’s a reason WHY (see what I did there?) 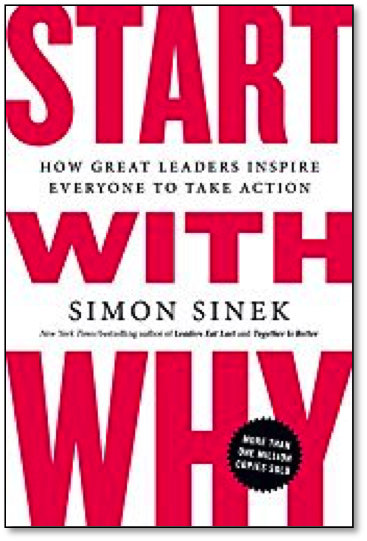 He’s an inspiration whose approach starts with asking simple questions, like: Why are some people and organizations more innovative, more influential, and more profitable than others? Why do some of us command greater loyalty from our customers and our employees? Even among the successful, why are so few able to repeat their success patterns over and over–as a serial entrepreneur would? Sinek figured out that people aren’t motivated to buy from us because of what we’re selling, they want to know WHY we’re selling it. He realized that people won’t truly buy into a product, service, movement, or idea until they understand the WHY behind it. Look at any successful entrepreneur you know–and your own responses to different pitches–and verify this assertion for yourself. What’s the takeaway? If you’re looking to build a successful, long-lasting business and become a leader in your field and community, then implementing his powerful idea about the “Golden Circle” might just be the missing tool you need to succeed. You’d have to be living under a rock not to know what a TED Talk is, but just in case, I’m here to help. 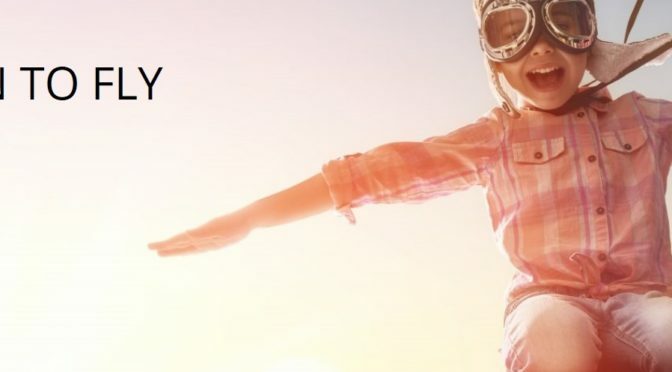 Technology, Education, and Design (TED) Talks are the widely known public speaking events where the world’s leading thinkers and innovators take the stage to share their insights on education, business, science, tech, and creativity. And when you’re the speaker and millions are going to be watching, you need to be prepared to sell your ideas persuasively. But don’t we need to do this all the time? Anywhere we speak? After all, speaking is one of the best ways to attract clients and customers. As founders and owners, we are the face of our businesses. 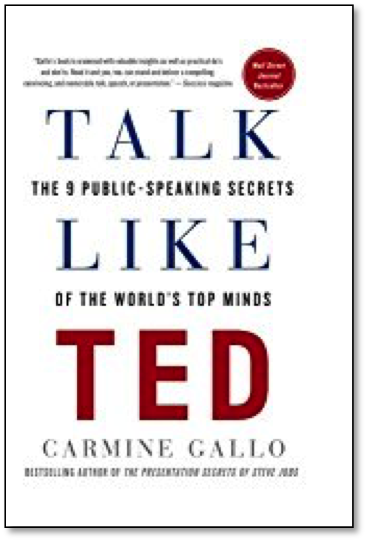 Carmine Gallo, a public speaking coach and bestselling author, gives us a step-by -step method to becoming an engaging, persuasive, and memorable presenter devised after interviewing some of the top TED Talk presenters. In this book, you’ll learn the nine secrets sure to make your next presentation dynamic. Here’s a truth bomb. If you’re looking to make a change in your life, you need to do things differently. Easier said than done? Sometimes the hard part is figuring out what changes need to be made. Good thing leadership expert Sally Helgesen and leadership coach Marshall Goldsmith brought us How Women Rise. In this book, Sally and Marshall identify 12 habits that hold many women back. If you resonate with any of these descriptions, you will gain a clear understanding of why some things that worked for you in the past can hinder your ability to move onward and upward. Every level of business success has its own rules and requirements. Learn from this what you can do today to advance your career. It’s not easy being a leader. Some people think leadership is about having a title, status, and power. Brown found in her research that real leadership is about seeing the potential in others and helping them grow into the best versions of themselves. The women I have met who are most successful are generous in sharing knowledge and connections, and even their wealth under the right circumstances. It is refreshing to know, as Brene Brown understands, that power and influence become infinite when we share ourselves with others. 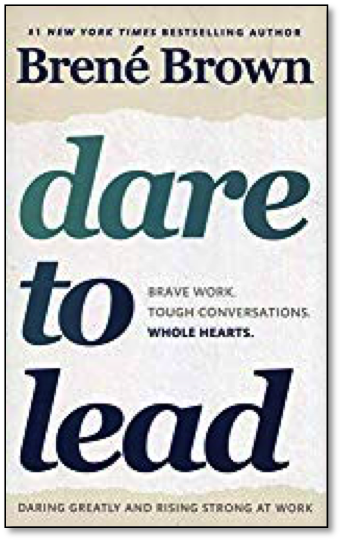 If you have high aspirations and want to improve your leadership skills and expand the roles you play, this is a must-read book. GRIT may very well be my new favorite four letter word. There are times in life when we look at successful people and wonder, How did they do it? What do they have that I don’t? What does it take to succeed? Chances are it’s “grit.” Growing up, our society trains us to judge others by their talent, looks, and social status. But this book reports that it takes a lot more than talent to get ahead. Grit is a combination of passion and persistence. It’s what keeps you going when the going gets tough and it’s what New York Times bestselling author Angela Duckworth talks about in my ninth pick this week. So, do you have the persistence and determination it takes to success? If not, are you willing to learn and train yourself? It takes a village. Have you ever heard this saying? Changes are you have. Do you believe it? I do. Nowadays, practically anything is possible with the support of others. That includes financial support! 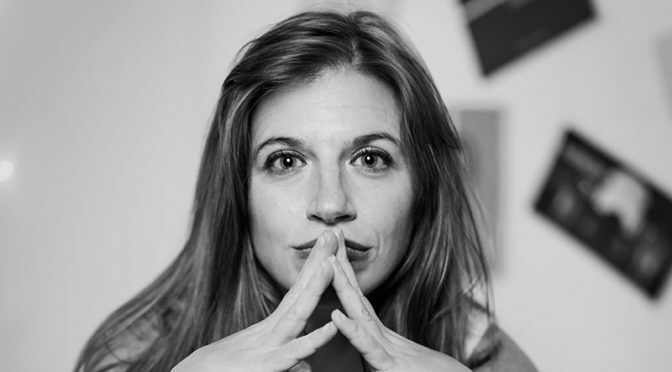 Alex Daly, a crowdfunding expert, is here to take you into her most successful campaigns in order to help you fund your next project. This book is a must read before you launch a Kickstarter Campaign to fund your next endeavor. Writers and other mortals function best from a state of inner calm. When we can breathe and are clear-headed, then we can be highly productive and creative. Meditation has a ridiculous number of benefits for mind, body, and spirit. And the advantage of the modern literature on meditation is that there is something for everyone. Everywhere you go people are telling you that you should be meditating. But if you’re like many others, the prospect of sitting in silence with your eyes closed sounds dull or uncomfortable. 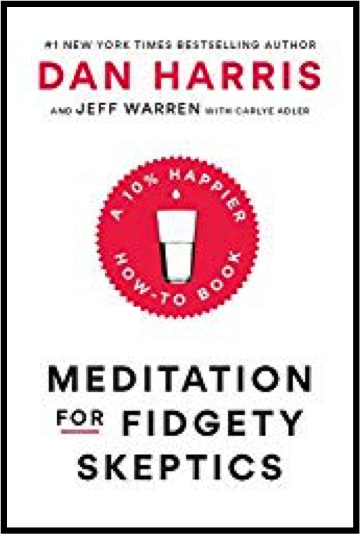 So, if you self-identify as“fidgety,” or “easily distracted,” then you might like this book. Too busy to meditate? Can’t turn off your brain? Curious about mindfulness but more comfortable in the gym? Try this practical and at times funny book to turn things around. The other type of reader this book is intended for is the“skeptic,” meaning, an individual who doesn’t believe in the merits of meditation. This is a totally different issue. I once dated a supercilious Russian dude who told me, “I feel sorry for people who chant because they look like imbeciles.”Needless to say, we were mismatched as a couple! Chanting and meditation are activities I LOVE, and I can report first-hand that there are tons of benefits for brain and body. Skeptics are people who wouldn’t be caught dead touching crystals. They can’t sense energy. Poor them. They just don’t get it. In Harris’s book, written in collaboration with master meditation teacher Jeff Warren, the purpose was for them to road trip and figure out what’s stopping us from taking advantage of these powerful benefits and how to help us get out of our own way. The science is embedded. Dan Harris is a journalist, so he reports well. Sharon Salzberg is the ideal meditation coach for the beginner. She’s a cofounder of the Insight Meditation Center in Barre, Vermont. 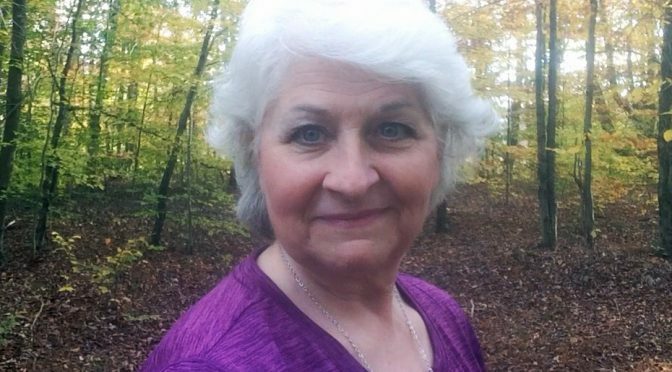 She has thirty years of experience and has written some of the all-time best books on the subject of Buddhism (Lovingkindness). She presents the information in clear language that’s not fussy with strange jargon. I picked this book for my top ten list because it is a 28-day program that treats meditation like exercise. Your meditation muscle gets stronger as you inaugurate the habit. This means that in a month you’ll be gaining the benefits of reduced blood pressure and stress, increased focus and alertness, better health, calmness, resilience. Salzberg weaves students FAQs throughout. Gives instructions for twelve alternate meditation practices (something for everyone). It’s just another great book from a great teacher who’s a person I like. Nobel Prize-winner Tenzen Gyatso, better known as His Holiness the Dalai Lama, exiled spiritual leader of the Tibetan people, has written numerous books on Buddhism that have been translated in the West. Perhaps the biggest gift he gives us is the gift of showing us a path to happiness. Using the story of the Buddha’s awakening to dictate his contents, the Dalai Lama teaches basic disciplines needed to move through three stages of development of our minds. Practices to cultivate morality. Practices to cultivate focused concentration meditation. Practices to cultivate wisdom. A great book for those who would establish grounded daily practice. I had the sincere pleasure a few years ago of doing editorial work on the manuscript for the book Shift into Freedom. 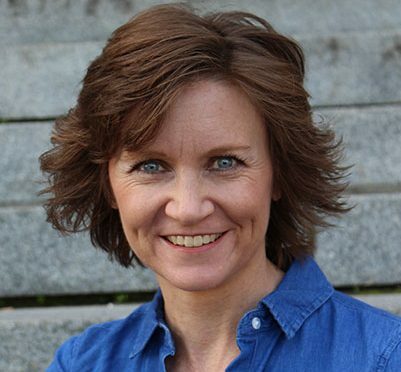 Loch Kelly, founder of the Open-Hearted Awareness Institute in New York City, is a psychologist and meditation teacher who is a super clear teacher. In his book he talks about the gradual path of awakening (and compares it to the sudden path–both are true possibilities), and he talks about experiences such as spiritual detox and spiritual bypass that are very real when awake awareness produces an effect on a human being. Fortunately for us, he has generously placed many videos on YouTube (view the one below, for instance), which correspond with teachings from his book. Loch has been initiated by leaders of many schools of meditation and spiritual practice. Their verification of his approach and his ability to teach is meaningful. 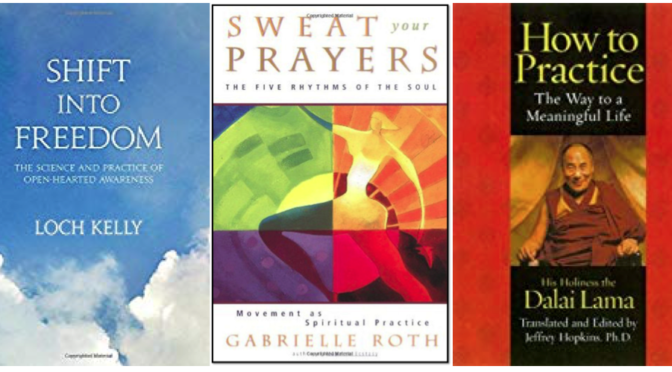 The late Gabrielle Roth was an incredible woman who saw energy embodied in the human form as rhythms. She marked how this paralleled emotional states, stages of development/maturation, and simply the tempo at which a day might land on you. Her 5Rhythms dance classes (now taught by her disciples) are opportunities to be fully embodied and present. In Sweat Your Prayers, this becomes a spiritual practice. Ten years ago I had the privilege to interview her about her work for several hours, for a book on integrative medicine that I was writing. I also, on another occasion, had the privilege to dance beside her and see how deeply she went into herself to express and process her condition on that day–by which I mean whatever was up for her in her mind, in her heart, in her soul. This was evident in how she moved and carried herself, which that day was rather gently. But intensely. And we met a third time at the launch party for that book–we were outside on the sidewalk looking in through a window making a great escape–something we’d done spontaneously as individuals. We talked about how painful writing a book can be. And we promised to discuss it further, but never got the chance. I cannot recommend her beautiful writing highly enough–or her movement practice. It can really crack your soul wide open. Many years ago–in 1995–I was given a copy of Jon Kabat-Zinn’s book on how to meditate and laughed in delight at the title. So true! Truth usually makes me giggle. When I dug into the book, I discovered morsels of wisdom. Morsels of insight that were small enough that I could wrap my untrained mind around them. Since then, whenever someone asks me what they should read to learn to meditate this is always one of the books I recommend. Most authors of this ilk write several books and create a library. Kabat-Zinn’s other book way back when was Full Catastrophe Living. He comes by his views honestly from working with people wrestling with illness. He taught Medicine at the University of Massachusetts at Amherst for decades. Being that I have always viewed my life as a process of staggering from one change to another, one drama to another, I value the simplicity of the way meditation is laid out. Why do we need so much variety of practices? We don’t. Find one that works and keep doing it and let yourself be led. Surrender. Twenty-first-century healers and musicians owe it to themselves and the world to develop comprehension of the transformational power of sound and music. From the effects of different drum rhythms on our brainwaves, to the positive impact of vibrational frequencies on the physical structure of our cells and organs, anyone who can hum or sing or clap or stamp their feet already has within their grasp some of the best medicine on Earth. Try toning if you have a headache! 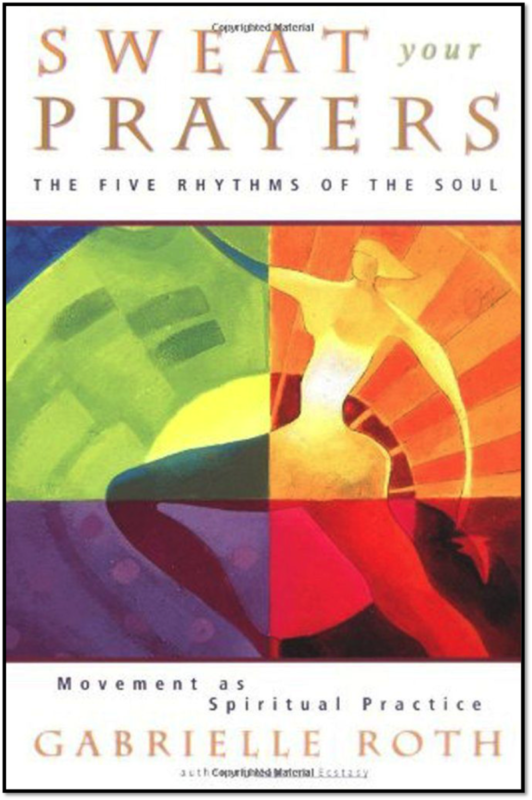 Again, I am so proud to say I was the editor of this book, which has garnered advance praise from luminaries that include Grammy Award-winning recording artist Chaka Khan, spiritual teachers Marianne William and Michael Bernard Beckwith, shaman Renee Baribeau, and renowned flutist Wendy Luck, among others. The power of sound and music has been familiar to ancient and indigenous healers in every culture around the world for millennia. This book explores that history and then gives detailed instructions. It also describes recent scientific research on healing cancer and awakening the vibrations in solid objects–and details how recording music tuned to certain frequencies changes people’s moods. You can download a free song in MP3 from Flicka Rahn’s album Icaros: Chakra Landscapes here. A classic book to help women put themselves front and center in their lives. To say no. To take time for self-care. This book combines inspiring quotes with short reflections that are encouraging and reassuring reminders to treat ourselves with loving kindness. It only takes a few minutes to bring wisdom into each day. Organized as a calendar year, starting on January 1. Frankly, I haven’t read this book cover to cover yet. But I was so drawn in BY the spiral on its cover that I had to add it to my list as aspirational reading material for the winter. The lunar calendar has thirteen moons, and Wild & Wise has 13 goddess-centered meditation practices to do on your own or in women’s circles. The book is also organized by season, and we are in the season of darkness and making the inward journey now (it is December at this writing). preparing ourselves, like Mother Earth does, for springtime renewal. Multicultural, rather than mono-ethnic. I look forward to reading this slowly and with deliberation. CC Webster is a hoot! We always laugh when we talk. Even so, I am moved by her story of her year from diagnosis to remission from cancer, which occurred between age 29 and age 30. This book is her answer to the question, What does it mean to be one of the lucky ones that survive cancer? In our conversation, you’ll find out how CC and I met seated side by side in a café downtown in New York City in a “divinely orchestrated” moment, what it was like to take the hardest thing she’d ever endured and turn it into a source of creative expression, and hopefully a source of inspiration for others, how readers are responding to the descriptions and truths she reveals, what its like to lay bare for the world one’s greatest vulnerabilities and to draw strength from them. So, That Happened, is funny, touching, and honest, and it is a light in the darkness. You are not alone. 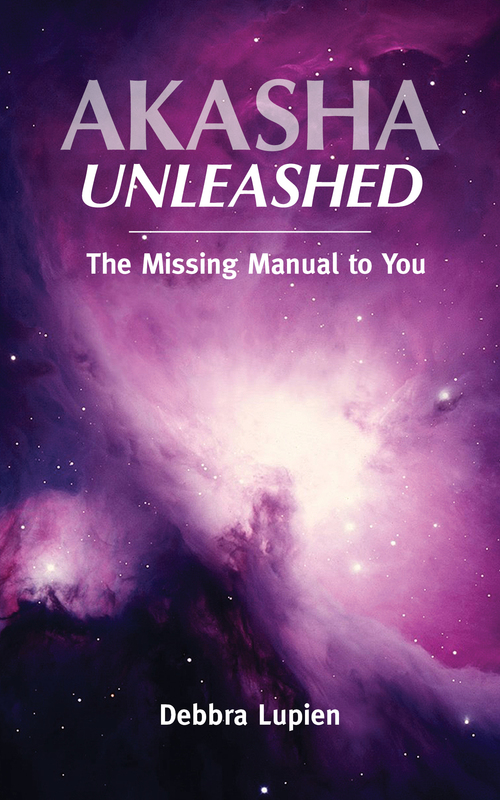 Join me for a delightful conversation with the Answer Diva, Debbra Lupien, author of the new international best-selling book Akasha Unleashed: The Missing Manual to You. I took this opportunity to ask questions about the Records: What are they? Why should we be interested in “reading” them? What’s it like to experience the Records? How do they help us find our purpose? And more. Right in the middle, Debbra surprised me with some information she offered about my soul purpose. I hadn’t expected it. But it felt very affirming and “right” on a professional level. You’ll have to read the book to learn how you can reduce the dissonance between your ego self and your higher self and soul. And once you do, your plans could come to fruition more rapidly and in ways that delight you. 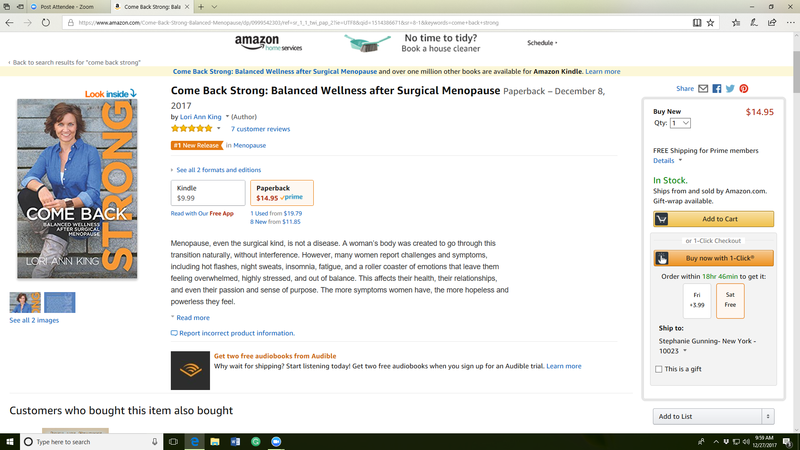 Lori Ann King joins me in this insightful interview to discuss her new book release COME BACK STRONG: BALANCED WELLNESS AFTER SURGICAL MENOPAUSE, which is a holistic look at preparation for and recovery from surgery. She shares what to do moving forward to feel great and lead a purposeful and active life as a woman. Some 600,000 women per year in the United States have this intense and transformative experience, and as an athlete, wellness coach, and someone who has been through it herself, Lori Ann has tons of tips to share. Visit her website: www.loriannking.com and sign up to get her excellent free reports. 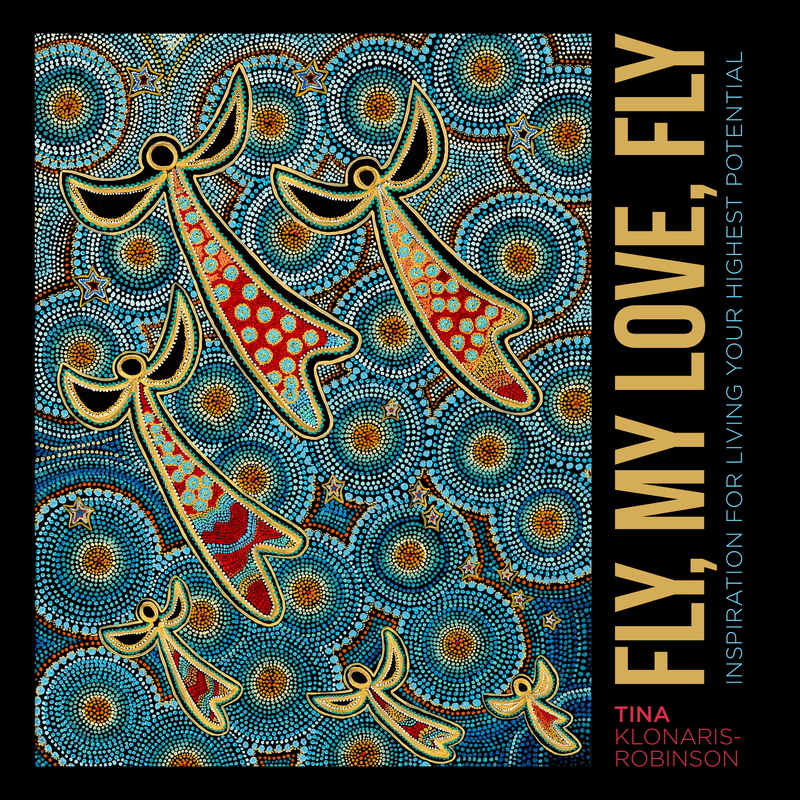 My friend, Bahamian author and painter Tina Klonaris-Robinson has just published her first art book. She’s become an “accidental” painter in her forties, drawn to the canvas as a form of meditation. As a result, special energy is imbued in every one of her works of art. They’re healing paintings filled with angels and sea creatures. Natural. Innocent. 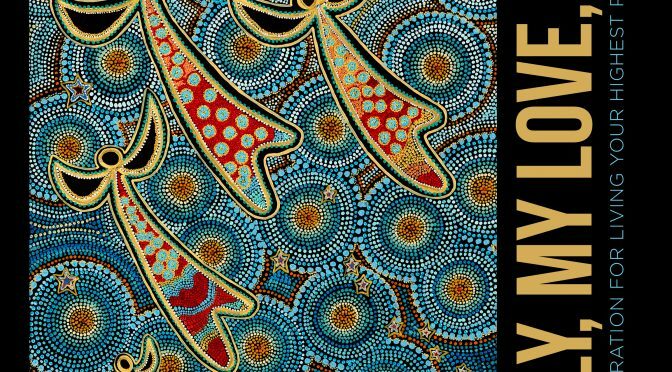 They sort of remind me of the Aboriginal art of Australia because they have so many dots in them. I keep telling her I see the dots as cells alive with energy. It is my honor to be her editor and consultant. She’s changing lives with her work.